SEPA provides a harmonized set of rules governing bank-to-customer relationship. In order to achieve a coherent and complete regulation of payment transactions, certain aspects must be regulated consistently in inter-bank and bank-to-customer sphere. It follows that for the pan-European payment system to function; all three layers of payment transactions (bank-to customer, inter-bank and processing) must be harmonized. 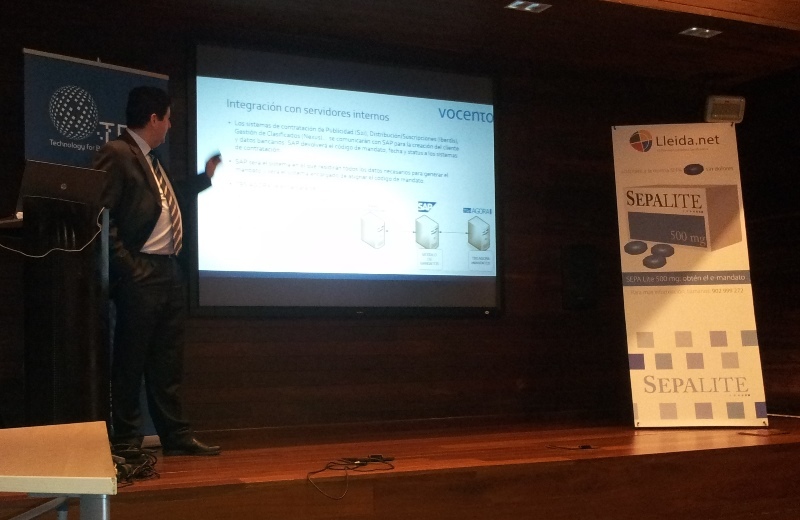 TBS held in Barcelona Activa an event to explain to what extent SEPA does affects businesses and which are the available solutions. The event was structured around five main thematic specialities:Mr. Francisco Javier Espejo, for financial-related issues; Mr. Sisco Sapena for registered electronic communications ;Mr. Xabier Ribas, for the legal ethical use of Information technology, Mr. Angel Luis Ramirez,for large companies’ adaptation, and Mr. Oscar Saro, for businesses technical solutions. On his turn, Mr Sisco Sapena, explained that registered electronic communications are communications that can be used as evidence before a court of law, if so required. Getting written consent from your customers is a MUST with SEPA . To that end, both SMS and registered e-mail are simple and convenient to use. Xavier Ribas gave a simple explanation about SEPA mandate forms. At first, SEPA rules were limited to handwriting consent. Hereinafter, the EPC clarify the trend towards the use of technologies to get the e-madates. Xabier Ribas measured different options according to commercial needs and possible risks. He recommended e-mandates via registered electronic communications as the best balanced, simple and convenient choice. Mr. Angel Luis Ramirez provided how Vocento group is implementing the adaptation .The process involves several departments; human resources, administration, sales, and management. We have to keep in mind that it doesn’t have to do only with technological adaptation but also to do it in a comprehensive way. They have turned to TBS solution, an integrated platform within their management software. To finish with, Mr Oscar Saro made a demo on TBS Agora emandates. He showed how to integrate it with the database, how to create the commands, how to send through registered SMS with a key to the e-mail and how the recipient replies to the certificate and obtains the valid emandate. After the presentation the questions from the attendees, moved from general ones about deadlines to concerns on how to find agile adaptations preventing any possible risks.